The Divine Sanchit Karma Cleansing workshop was conducted using actual divine spiritual energies for the first time in the history of the world by spiritual healer Mr. Chandrashekhar Patil. Karmas mean our individual thoughts, actions and deeds accumulated over thousands of years and carried by the soul through consequent births. Our soul travels with this baggage of good and bad karmas in its journey of countless births. When a soul takes birth as a human, the good and bad karmas manifest in that person’s life as problems, opportunities, successes, failures and so on. The bad karmas cause health problems, financial difficulties, strained relationships, etc. 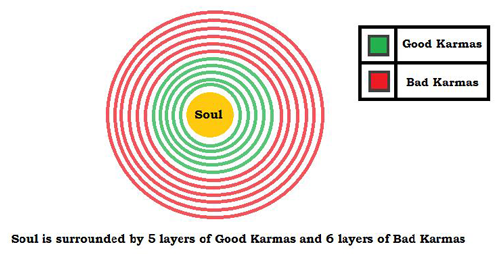 Your karmas affect your soul, body, chakras, mind and your aura. When we do Karma cleansing, what we actually do is release the bad karmas using actual divine energies. Spiritual healer Mr. Patil works on the bad karmas to eliminate their effects on the soul and hence the body and mind. Once the bad karmas are released using divine spiritual energies, you will experience a drastic change in all walks of life. Diseases will start curing, finances will increase and relationships will improve. Not only this, but your mental health will improve and you will feel deep calm and peace. For more details regarding the Divine Sanchit Karma Cleansing workshop, contact us!